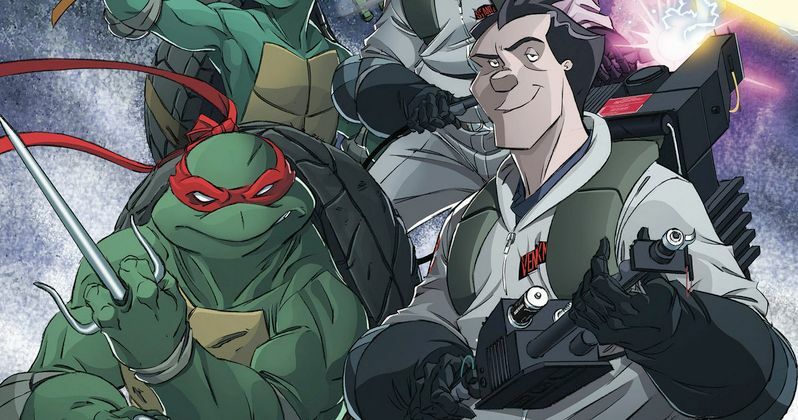 Two teams of legendary heroes will join forces this fall to save New York City and the world from the paranormal and the monstrous when the Teenage Mutant Ninja Turtles cross paths with the Ghostbusters! With both franchises celebrating their 30th anniversaries this year, it's never been better time to team up Proton Packs with Ninjutsu! The crossover is written by two talented creators who couldn't be better acquainted with these unique franchises - Tom Waltz and Erik Burnham. In addition to writing the ongoing Teenage Mutant Ninja Turtles series at IDW, Waltz has also served as editor for the ongoing Ghostbusters series, written by Burnham ­who, in turn, co-wrote the critically acclaimed series Teenage Mutant Ninja Turtles: The Secret History of The Foot Clan. "A couple of years ago, Tom Waltz and I chatted like the fans we are about how insanely fun this crossover would be if we ever got the chance to write it. As I sit here today, my excitement level is at eleven." "This is an idea that Erik, series editor Bobby Curnow, and I have bounced off each other for quite a while. And being as deeply entrenched in both properties as the three of us are gives us a unique perspective on how to bring them together. And what better time to do it than during the combined 30th year anniversary celebration?" "Both Ghostbusters and Teenage Mutant Ninja Turtles are fun, funny and just a little bit weird. So putting the two together is a natural choice, especially when you consider the fact that Tom and Erik have worked on both properties for years. This one should be an absolute blast!" Long-time Ghostbusters artist Dan Schoening will take on cover and interior art duties. Currently showing off the immensity of his talents in the Ghostbusters arc "Mass Hysteria," Schoening has proven his ability to give this special mini-series the epic scale it deserves. Issue #1 will sport a variant cover by T-Rex Jones, who has provided covers to both series at IDW.